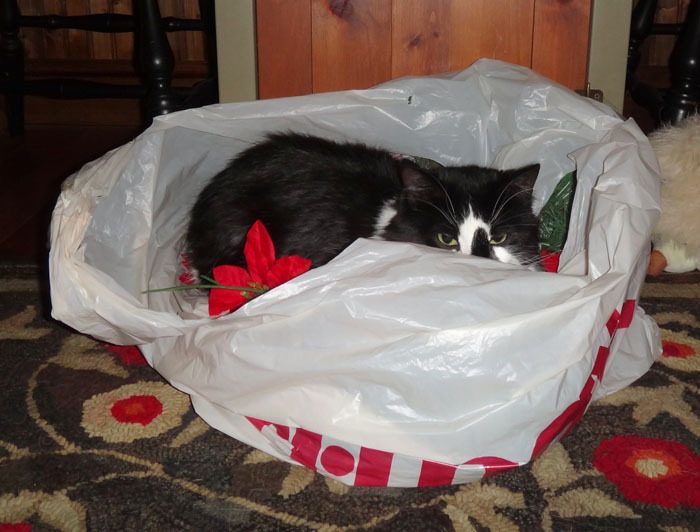 Comic and Curious Cat and Cardinals! Winter Birds: Real and Make Your Own! Cardinals and Puppies... Free Patterns! Kitty Helpers and Rug Progress! 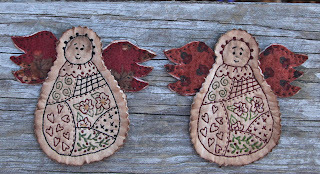 I treated myself to a new pattern called Guardian Angels. 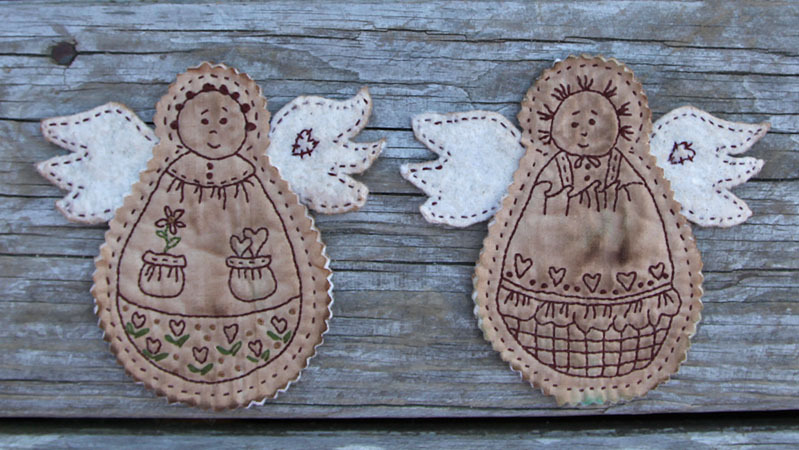 I thought it was nice as a gift idea and they can be used for ornaments for next Christmas. The pattern is by Bird Brain Designs. She also has some nice free designs. I made the first two, like the pattern, with batting wings. The thing I didn't like was, the stitching shows through the batting on the other side, so I don't feel it is a very neat finish. 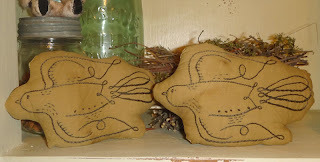 I antiqued them and put in the dryer, and I like how they held up and how they look, so maybe a double batting to hide the sloppy stitches on the heart. I have a new computer, and the photoshop upgrade, so I can use my new camera now. I still need to practice with settings and getting the photos to look the way I want, so I hope they look nice on your computer. The second pair, I went with extra colors and like how they look. I also used fabric and a piece of batting to make the wings. I also stitched the body using thread and running it along the outer stitch to hid it. I think it has more substance to them and a lot neat on the back side. I don't know what is sillier, my collection of cats or my real kitties. 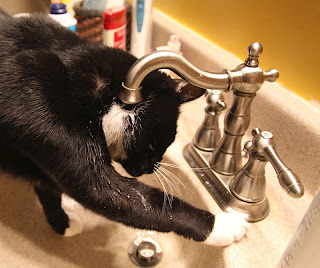 Moki seems to spend half of his time at the sink, either drinking or washing and sometimes just playing. Today he decided he needed a bath. And I redid the photo I lost. 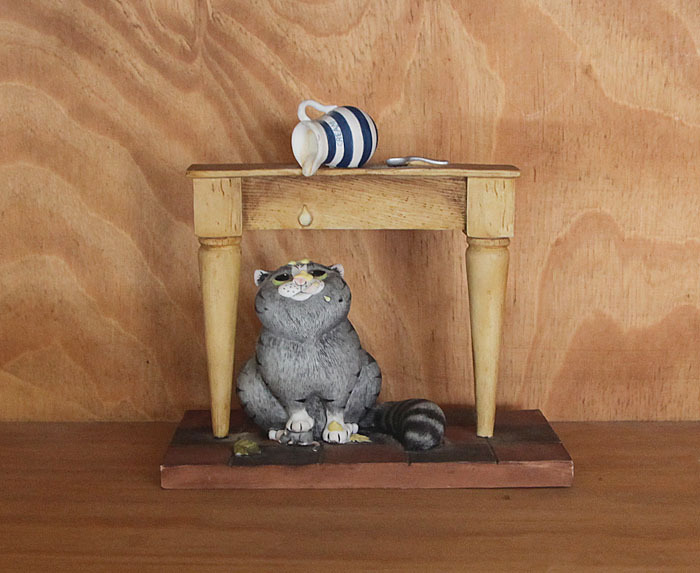 This is from a collection called Comic and Curious Cats. I started collecting them, then decided I had enough kitties on my shelves, but sometimes I find something I cannot resist at the thrift. This one is for me. One of these days I will need to make a set up for these types of collectibles, maybe make some trees to go with them. This week, I received a photo of a wonderful cross stitched piece of my snowman freebie. 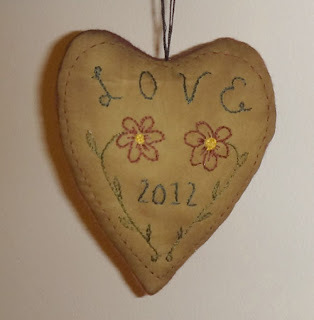 This piece was done by Cathi of Cathi's Stitching Blog. I love how she did him and the beautiful colors she used. I never got a chance to do him, so it is fun to see him all stitched up. Last week I finally got myself a new computer. Mine was getting old and I couldn't upgrade anything and everything was slowing down or crashing, so it was time. I use a Mac Book pro and got one with enough to run my programs, since I do love photoshop and I was able to upgrade that too. So, I tried some photos with my new camera and the new photoshop. I have a lot to learn. Like why the photos I did, did not save in the file I wanted them in, lol. So, here are a couple for tonight. I love to thrift, you never know what you will find and a few weeks ago I found some Comic and Curious cats sitting on the shelf. 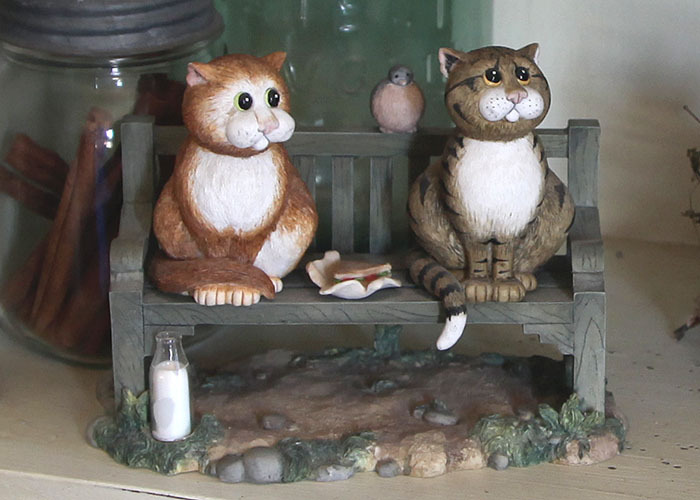 The kitties on the bench is a piece I loved and had to have it. That one seems to have disappeared in the computer, somewhere. 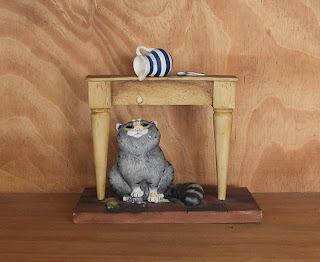 I couldn't just leave this one sitting on their shelf, maybe it will make a nice gift for a cat lover. They are just so fun and pieces that make you smile. 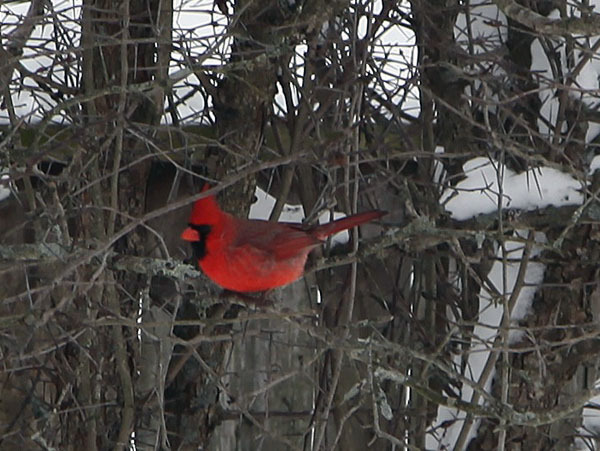 And here is a cardinal who visits every day. 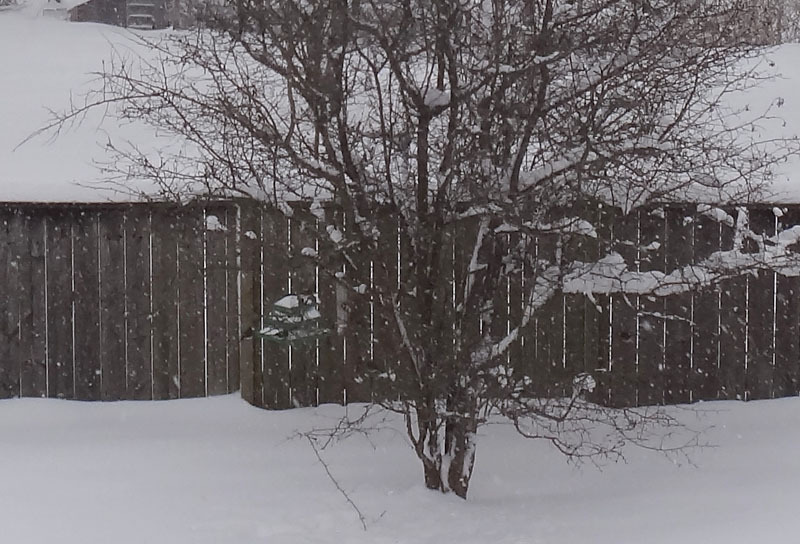 I had to get it with a regular lens, so what zoom it had, made it a bit blurry. Today he sat in the other tree, while his mate had a meal, it is so sweet that they watch out for each other. I have been working on my rug, so I will take a photo of that tomorrow. I found this wonderful pattern and just had to make some. 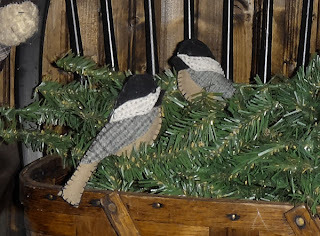 The pattern for this little Chickadee can be found at Downeast Thunder Farm's blog. I also noticed she has a new one this week, a duck, perfect for easter packages. I used a tan wool for mine but I think a textured tan or gray for the body, would be better. I stuffed mine a bit, before sewing it up, to give it some body. 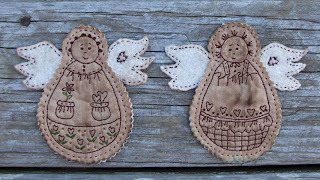 I found a new blog and she has some wonderful tutorials and templates that you can make for yourself or as gifts. The site Apine Industriose has some english, but you will have to figure out the patterns by yourself, but most are simple and easy to follow along with the templates and the color photo. I am not sure if I did the cardinal the right way, but my gusset didn't make sense, so i cut it down a bit. I made a few changes and added wings to mine. 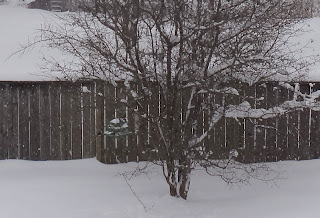 I have decided to put some cardinals and other winter birds, around the house for a simple decoration. We are getting siding put on and they bang all day, so I had to take things off the walls and the house is a mess. 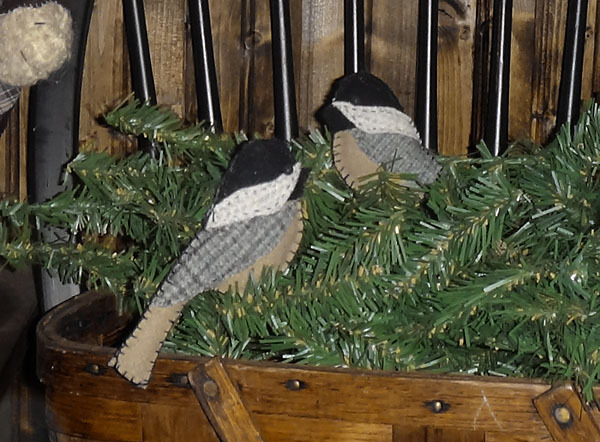 The birds are something simple I can make and enjoy without having to worry about them breaking. I also found the puppy template and instructions on her site. Just click on the link for animali and it is on the first pages. It is a site, well worth browsing around and clicking on the links, lots of goodies to make. The puppies have magnets in them, so a good idea for gift giving too. 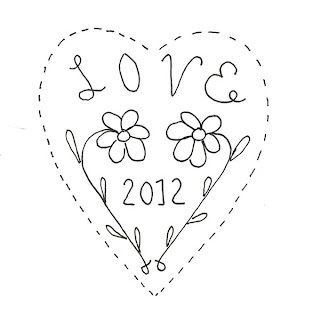 I was in the mood to make another heart and did up a little doodle to stitch on it. 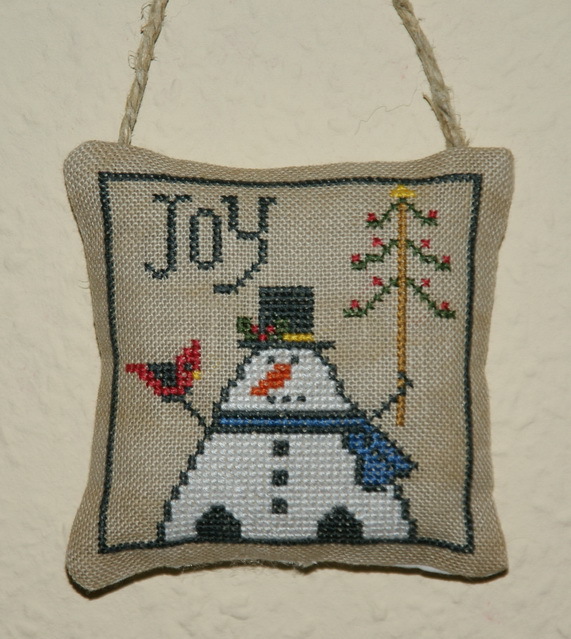 I used two strands of floss and a stem stitch. When I was done, I cut out around the stitches and sewed it, right sides together to a piece of wool. Slit an opening on the back of the wool and fill it, then I covered it with a wool heart and a blanket stitch. A nice simple project that you can whip up in a night. Here is the drawing that I used, I hope you enjoy making some for yourself or for a friend. I decided to make another Bad Birds design since they are so fun. 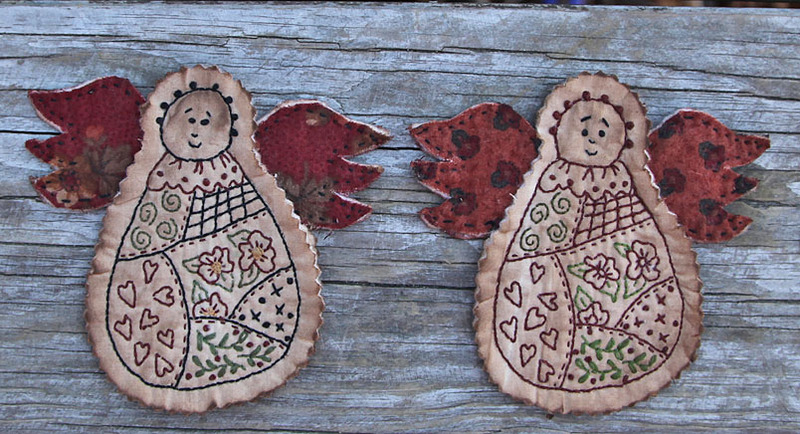 I enjoy making happy pieces in the winter, it chases away the winter doldrums. 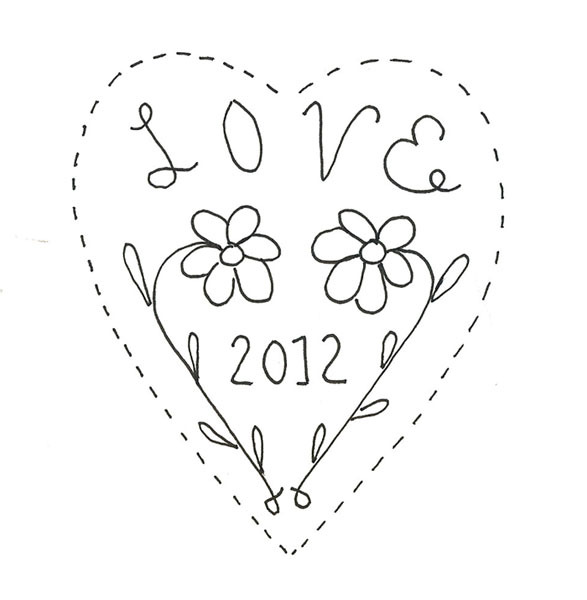 You can find this and other free patterns at Badbird's Blog. 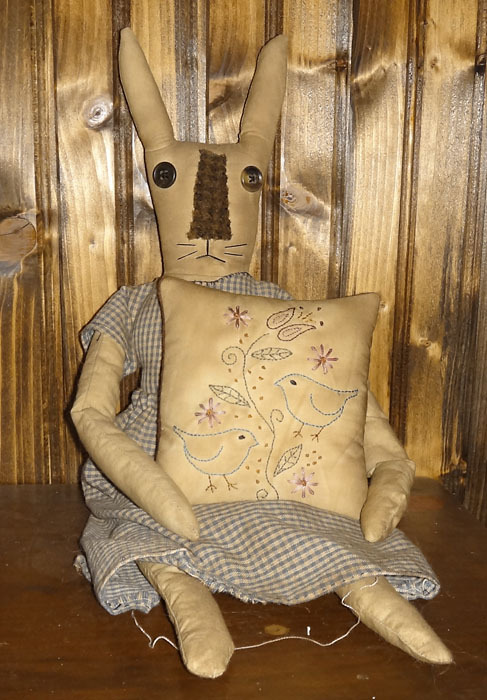 The bunny who is holding the pillow was made from a pattern by The Krazy Kraft Lady. If you click on her free link, you can find the template, as well as other patterns and tutorials. I started cleaning up the christmas decorations, a bit at a time and of course the kitties have to help. 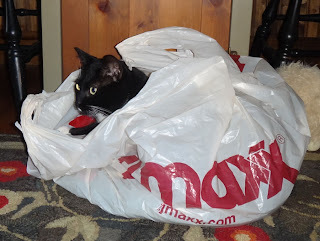 Nothing like a plastic bag to amuse them. And once Moki got bored of playing, Izzy had to try it out. Then Moki went into his stalker mood and Izzy did her screaming routine until he stopped harassing her. 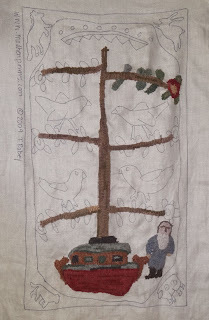 And I worked on my rug, the tree is done and two birds. I ran out of colors, think I used the wrong ones in the wrong places, but that is ok. I will work the background from the outside and inside the motifs. That way if I run out of colors, I can substitute easier. I have found myself missing rug hooking and thinking of finishing one I was making for my bedroom, when a surprise box arrived the other day. My good friend Cyndi was cleaning out her stash and gifted me with some new rug patterns, as well as some cross stitch patterns from Primitive Betty. Not only did she send the patterns, but two were kits and one has all the wool cut for it. Now I could not resist that, no hassle rug making, just hook and enjoy the process. It is also one of my favorite subject matters, Noah's ark, so that is what I started this weekend. The pattern is by Mad Hen Primitives and comes with all the wool I need. They are all quality, hand dyed wools, so it is a pleasure to hook with them. 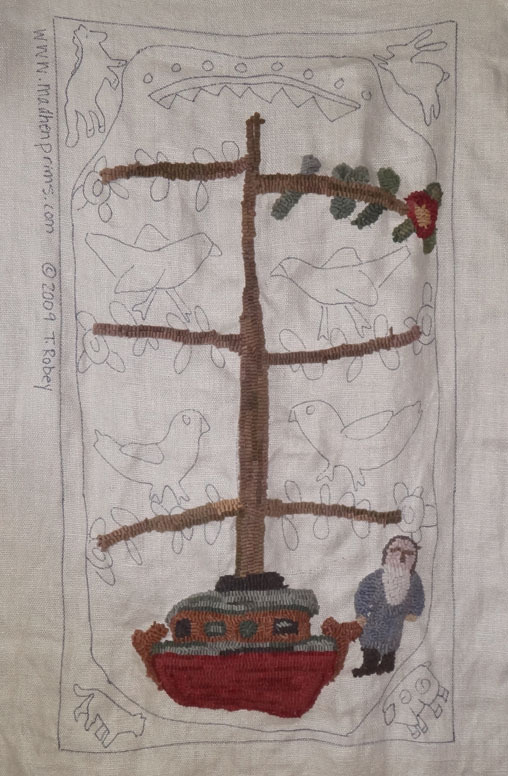 I think I might have messed up with the tree colors and used the bird's pieces, so I will hook the bottom ones last, when I see what I have left from the tree area. 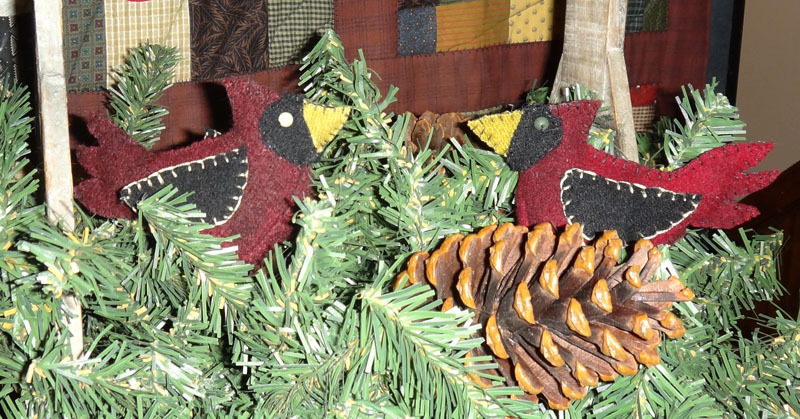 The birds are dark browns with a mix of other colors, so I can always pull out some dark pieces from the tree and replace them with the lighter shades. 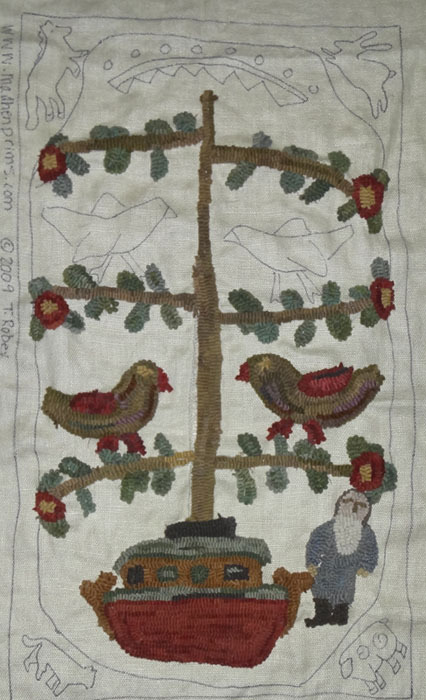 The wool is marked for each piece, but the tree had the bird bundle mixed in with it. 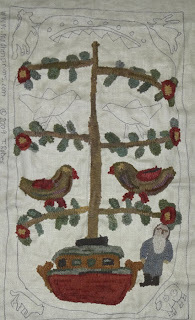 Now I am thinking I might go with a folk art biblical theme in my bedroom and hang this on the wall, now I need to come up with a quilt that will match it all. And here is why I have no fun pictures of Moki lately. 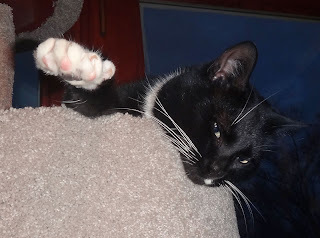 He has taken over the tower, he is king of the hill and lets poor Izzy know it. If he is zonked out, she can usually sneak into the bottom bed. 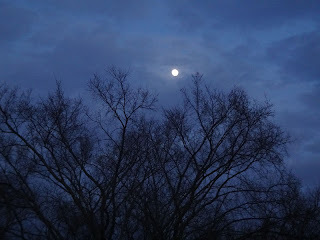 I love the sky in winter, we had a beautiful sunset and the moon was out early. 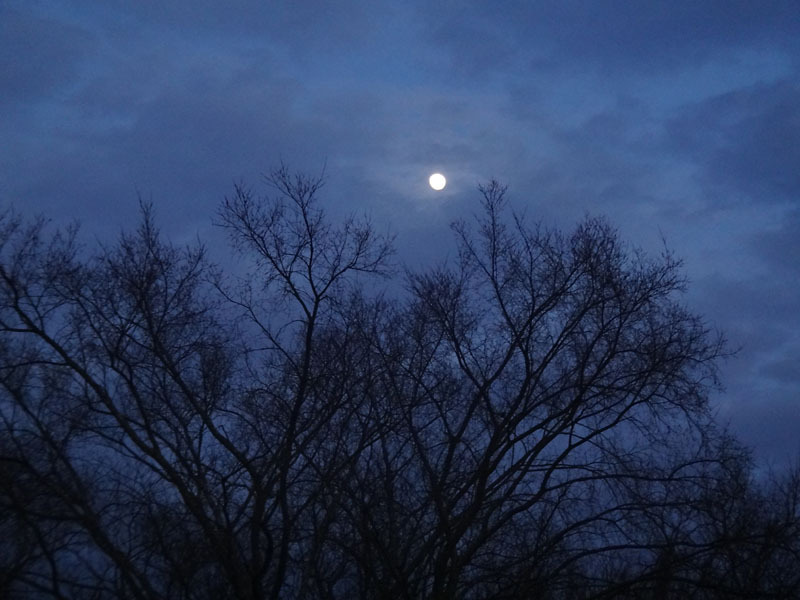 I love to go out at night and just stare up at the stars, a nice way to relax and center ourselves. 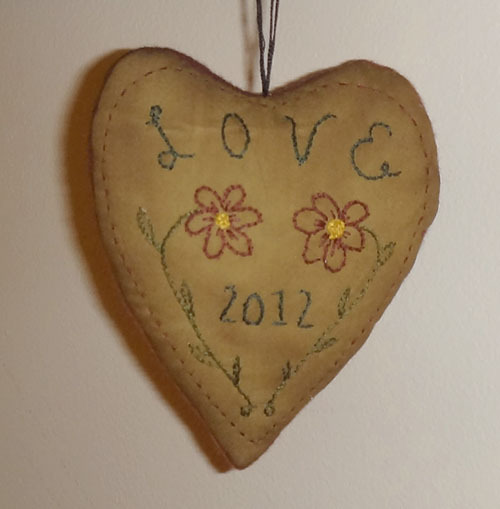 The stitchery pieces I do are always by hand, using dmc floss. My machine does embroidery, but I haven't figured it out yet and I would use that for home decor, prims and gifts, I like to do by hand. Also, if you have a question and you are a no reply, I cannot answer you. 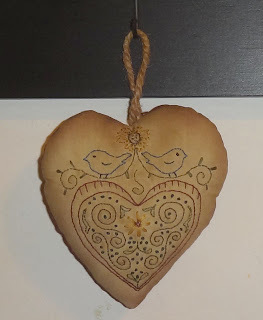 The pattern is by Kathy Schmitz, I just love her designs and would love to do more of hers. I started these yesterday and finished today, so they work up fast and great idea for gift giving. You can follow her blog for new designs or visit her etsy shop. I used tea stained muslim and the floss is a dark shade, 2021, so not as light and glossy as it looks in the photo.